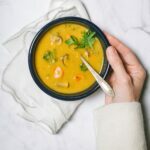 This germ-busting soup gets a beautiful golden color from the turmeric, and everything in it has an immune-building, nutrition-boosting benefit! Heat coconut oil in a large saucepan over medium-high heat. Add onion and garlic; cook for 3-4 minutes or until fragrant. Add turmeric and cayenne pepper; stir well and cook another minute. Stir in vegetable broth. Add 3 (15-ounce) cans beans and salt; cook until heated through. Transfer mixture to a blender container; pulse until smooth (or use an immersion blender to pulse until smooth). Return mixture to saucepan and return to heat. Add kale, carrot, mushrooms, and oregano. Stir in remaining can of beans. Bring mixture to a simmer and cook for 10 minutes or until vegetables are tender. To Freeze: Cool soup completely, transfer to a BPA-free zip-top bag or container and freeze for up to 3 months. Or freeze several smaller bags to pull out small servings for unexpected immune-building days!